Even though I have to work today~I am still happy it is Friday!!! Yesterday I had my annual eye appointment. I had to get my pupils dilated (I hate getting that done!!! ), I could not see for 3hours after the drops went in my eyeballs. I had to make a few cards (including today's), so I hope it looks okay, LOL! 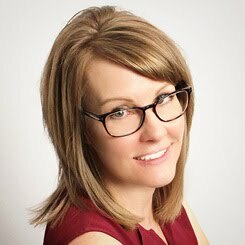 Luckily my prescription stayed the same, so no changes, but he did say I am a year or two away from getting bi-focals~WHAT!!!! I guess 40 is the magic age for your eyes to start going to pot. Oh well, what are ya gonna do?? I needed some masculine thank you cards, so I went with a very minimal, clean and simple look. I was happy with the end result, since boy cards are just not my thing!! It is also a good way to use up some of my hoarded patterned paper, LOL! Thanks for stopping by!! Enjoy your weekend! how are you doing today?? Boy the week sure flys when you have Monday off, LOL!!! 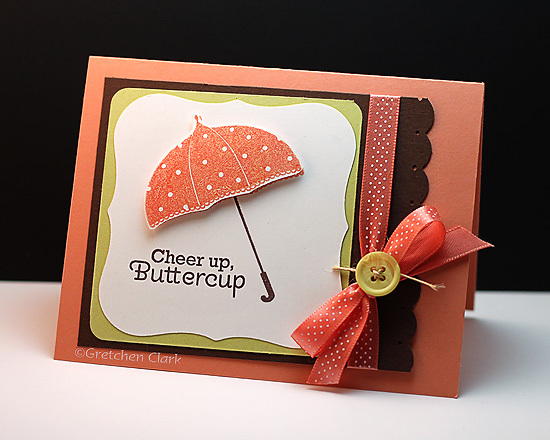 I needed a card for someone that needed some cheering up, and Scattered Showers seemed to fit the bill, how could it not with Dawn's cute sayings!! 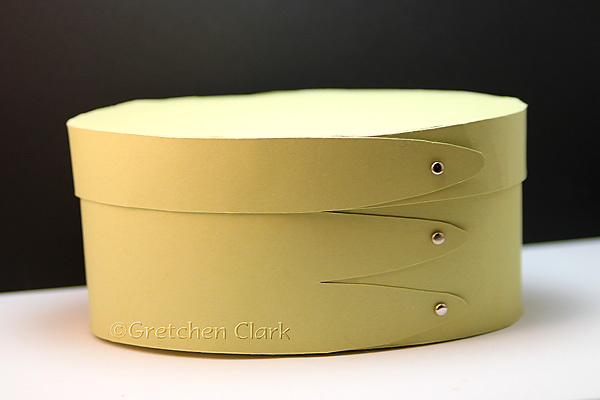 I paper pieced the umbrella top to give it some dimension, and of course I had to add some ribbon and a button. I was going to place a PTI order the other day and several things were on back order *sad face* I hope they are back in stock soon, because I really want that Enjoy the Ride set (with matching die plate)...how cute is that set??? Thanks for stopping by!!! Enjoy your day! Happy Monday~I am really enjoying today~because I have it off *woot woot* I won't be so excited on Friday though, since I will have to work, LOL!! Vacation time has arrived in our office, and everyone will be filling in for each other as we enjoy some R&R. My step dad (really dad!! ), Moe is going to be celebrating his birthday on 4/30, and since I know he doesn't read my blog~I figured I could post his birthday card. 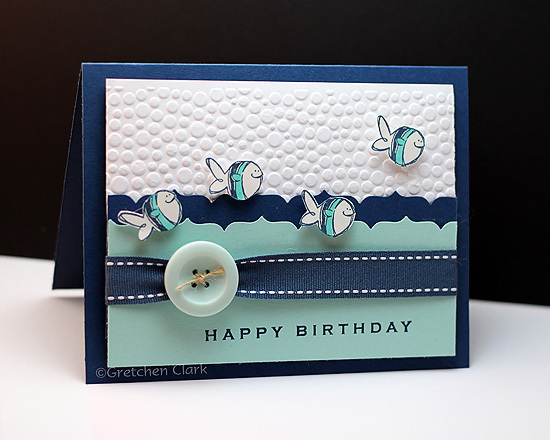 He is retired and enjoys fishing, so I try to incorporate a "fish" theme every year...unfortunately this is the only fish stamp I own (def need to find some more!!). It is from the SU! (retired) set, Very Punny. 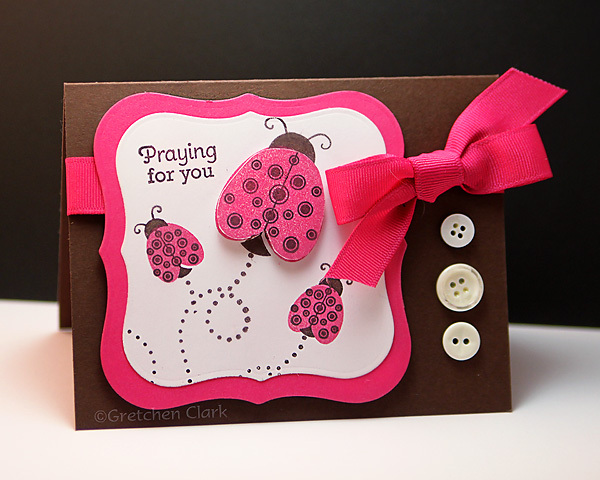 I cased this card from coriefoster on SCS, you can see hers here. It was such a cute card, that I really didn't change much. Thanks for visiting!!! Enjoy your day! But in the meantime, here are the pic's from my cruise~you can view them here. I have a quick post for you today... Administrative Professionals Day (A.P.D.) was this past Wednesday, so of course I wanted to whip up something special for the Church Administrator, Heather, who volunteers her time to help my hubby in so many ways!! And always tells him to "go home", which I appreciate (because Mike looses track of time when he is at the church) *smile*. Since I know she likes pink, I really went with a pink theme. And check out Pete (a.k.a. CRAZY Pete), he is too curious for his own good, LOL!!! 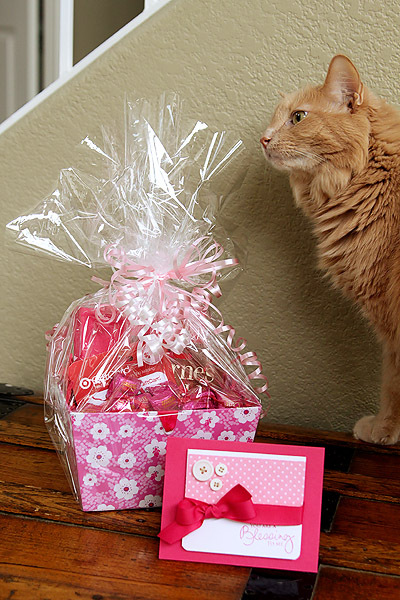 I found the cute little gift box at Target and filled it with some gift cards, chocolate and other goodies (Pete approved of this A.P.D. gift, LOL!!! )...and a big Thanks to Heather!!! Thanks for stopping by!!! HAVE A WONDERFUL WEEKEND!!!! Mike and I arrived back home safe and sound on Monday. We had a great time just relaxing an enjoying each others company!! I still have my sea legs, which is really weird, feels like I am still on the boat. I Googled it to see if there were such a thing and YUP!! there is, so I wasn't imagining it. 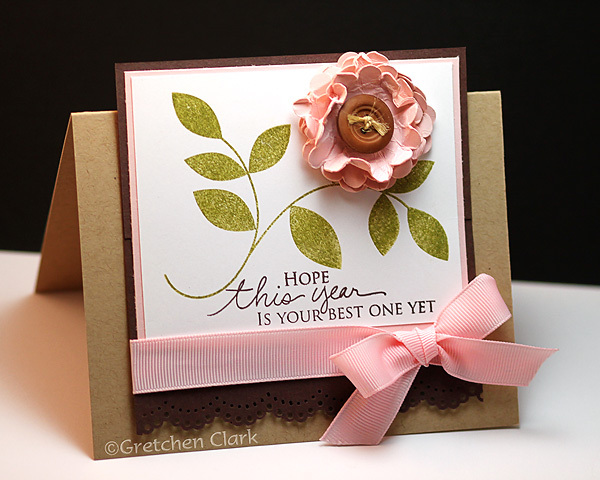 Here is another easy peasy card...I used my Nestabilitie die to cut out a scalloped rectangle on the card base, then just added some Dark Chocolate cardstock to the back and added a smaller stamped rectangle to the front with a pop dot...easy peasy, right?! Thanks for stopping by!!! ENJOY TODAY! I am heading back home today, so I will hopefully have some fun pictures to post from my mini vacation. Today Mike and I are heading down to Mexico...we will stop here and here, plus have a couple fun days at sea. It's Wednesday and that means one more sleep until Mike and I leave on our cruise...I am getting pretty excited (minus the huge list I have to take care of today). We fly to San Diego first thing in the morning. I will be without my cell phone, computer, or the Internet for 5 days~whoa!!! I think I will survive, but the first day may be a little weird, LOL!!! I have posts ready to go, so hopefully everything will go as planned on the old blog~o!!! There won't be much yip yap, since I have to post them a few days ahead of time and I am not that creative, LOL!! If I am able to get online I might pop in and edit some of the posts with our cruise adventures, but from what I am told you stay pretty busy the entire time you are cruising. I am sure I will have lots of photos to share. I have been seriously neglecting my SU! stamps, since I found PTI (I just LOVE PTI!!! 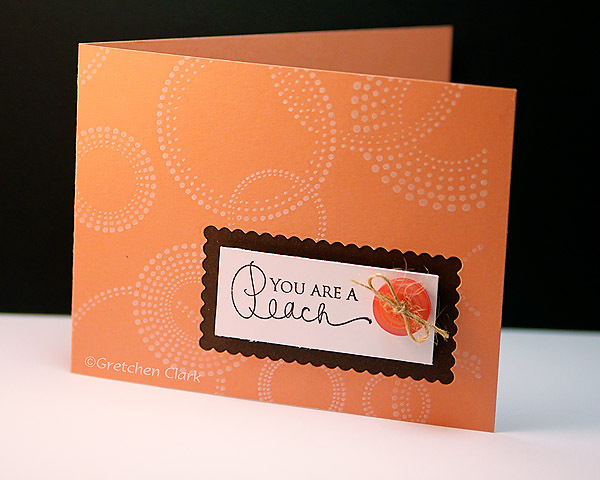 ), so I pulled out True Friend for a little stamping time. I did end up pairing it with a PTI sentiment, though. I also added a little bit of bling to the buttons with some adhesive rhinestones. Hope you had a fabulous weekend!!! I have been busy getting things prepared for my vacation, which starts this Wednesday *so excited* Mike and I have not been on vacation in quite some time~so I am really looking forward to spending some time together with no emails, phone calls, church stuff, etc...just some time relaxing by the pool and sight seeing (and people watching~I love to do that). We had a Family, Friends and Fun day at church yesterday...it was a lot of fun...cookout...bouncy houses...dunking tank...cotton candy...popcorn...fun times!!! I do have to say that being outside all afternoon in the 90 degree temps really wiped me out!! 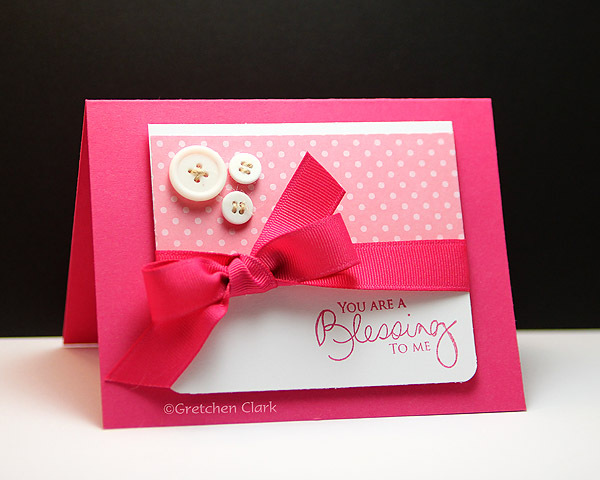 Here is a quick card I whipped up with some of my new Nestabilities dies. I actually had to find a different spot for my Cuttlebug in my craft room, so I could have better access to it (now that my die collection is growing!!). I am so ready for the weekend!!! I have lots of vacation prep to take care of this weekend *happy face* some shopping/groceries for Josh/list making (love lists!! ), plus I hope to get lots of stamping done so I have things to post while I am relaxing with my hubby in Mexico. I have been fascinated with Bento lunches for a while now...I really love to eat and I especially love when food is presented in a pretty way~I have been getting kind of sick of my usual lunch choices, and wanted to start taking something to work a little more appealing. I wanted to get one of these, but just could not justify spending that kind of $$ on a lunch box if I don't follow through with this bento phase. So I ended up getting this one to give it a try...unfortunately it is no longer available for purchase (from Tupperware), but you can find them on Ebay (that is where I purchased mine). I have to say that the containers were a really nice size for portion control (which I sometimes get carried away with, so I think it will be very helpful for my WW maintenance plan). I have been researching some new and exciting recipes, and hope to start bringing a more exciting lunch to work when I get home from my vacation~I will keep you posted on my progress, LOL! I got some new Nestabilities Dies with my birthday $$, so of course I had to break out my Cuttlebug to try them out, I used Label One for today's card. I then pulled out my PTI Little Lady set (which I have not used in ages), and whipped up a quick card. 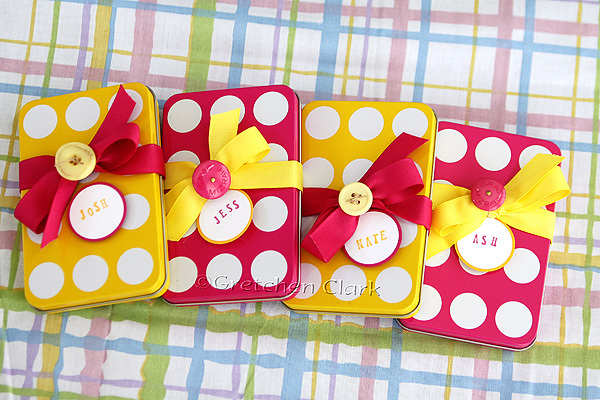 For some reason I am really going for bright colors lately (loving Raspberry Fizz). Thanks for stopping by~Have a Happy Weekend!!! How is your week going? I hope it is off to a great start. I am starting to get excited about my little vacation coming up next week *woot woot* Mike and I are going on a cruise to Mexico (this is our first time cruising~and I have heard really great things). Of course I will be bringing my camera~and I hope to take LOTS of photos!! Today's card is pretty clean and simple (right up my alley). 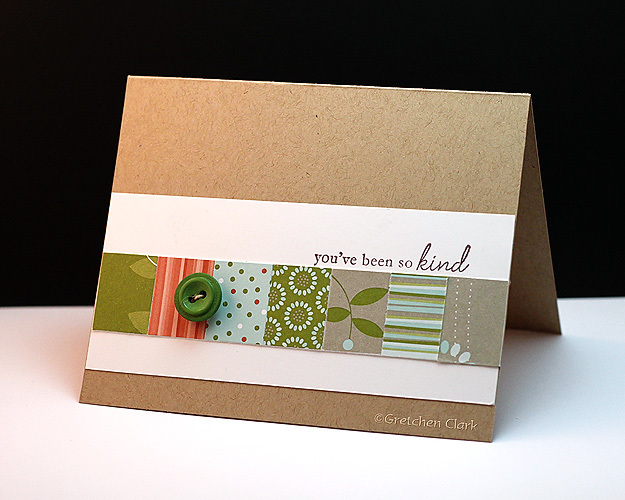 I didn't even add a sentiment to the card, because it just seemed to say to me "less is more" So I left it alone. 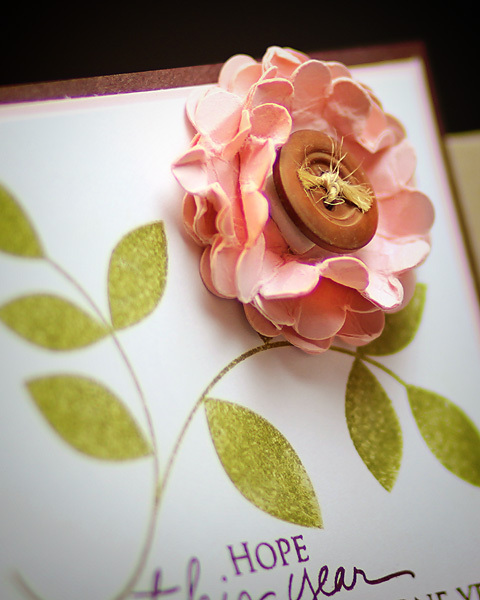 I used my 5 Petal Flower Punch from SU! 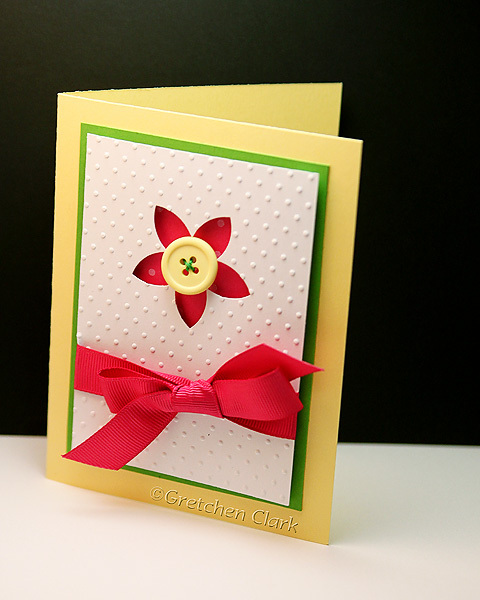 on a piece of white cardstock, then ran it through my Cuttlebug with the Swiss Dot embossing folder, then popped it up with some pop dots onto Raspberry Fizz/New Leaf and Lemon Tart cardstock, added some ribbon a button and Viola!!! I hope you had a wonderful Easter!! It was 85 degrees here and just a glorious day!!! Ashley and I had some time to kill before all the guys got home from church, so we took some photos (she is such a good sport!). Then we chowed down on a yummy ham dinner, went for a walk, and had dessert, we never got around to coloring our eggs (too tired), oh well, no biggie! they are pretty time consuming and since I would be putting these together on Saturday evening, decided to take another route, (sometimes it is good to K.I.S.S. ~Keep It Simple Silly~my paraphrase). I found these cute gift card tins at Michael's (right next to the register). I was happy with the end result!! Are you ready for Easter this weekend??? When Ashley and Josh were younger...we always dedicated Good Friday to Easter Egg Coloring. Now that they are older, they still like coloring eggs, but we usually do it on Easter Sunday after lunch because of their busy schedules. Luckily Mike and Josh love hard boiled eggs (yuck!!). I will be busy running around today (I am hoping to get everything checked off my short list(groceries, Easter basket stuff, dry cleaners, vacumm and bathrooms clean), I am hopeful to get it all done because Ashley's friend Lindsay will be visiting this weekend and I am going to do a photo shoot of the two of them on Saturday (looking forward to that), and after all the shooting (with my Canon) we will most likely get a treat here. I brought all my Easter treats to work yesterday (since I have today off *woot woot*), for my work peeps. April is a big Birthday month~so I have been making birthday cards. 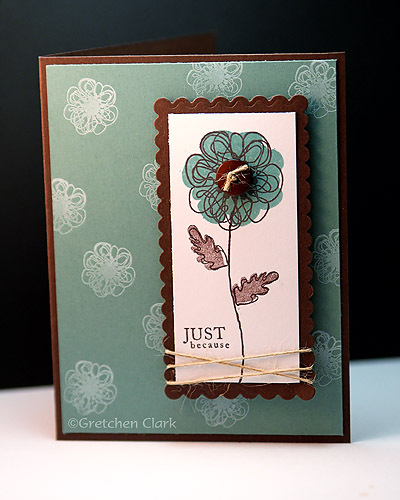 I wanted to try one of the smooshy flowers with regular cardstock, and I must say...I like it!!! You really have to crumple up the paper though, almost to the point of ripping.